Home Drape Official Blog: Royal Diwans Just Got Trendy!! Unusual abstracts, mosaic, geometric patterns, floral, baroque or paisley, there is so much to give a try this season for your living area. You can make two or more bright accents come alive on the diwan to make it more welcoming. Your deepest emotions can be shared with much joy, enthusiasm and energy over this sitting when an all new splendor would sit over it. The cottony features when would also come in the role, you can get a complete relief. It won’t trouble you during wash or maintenance. 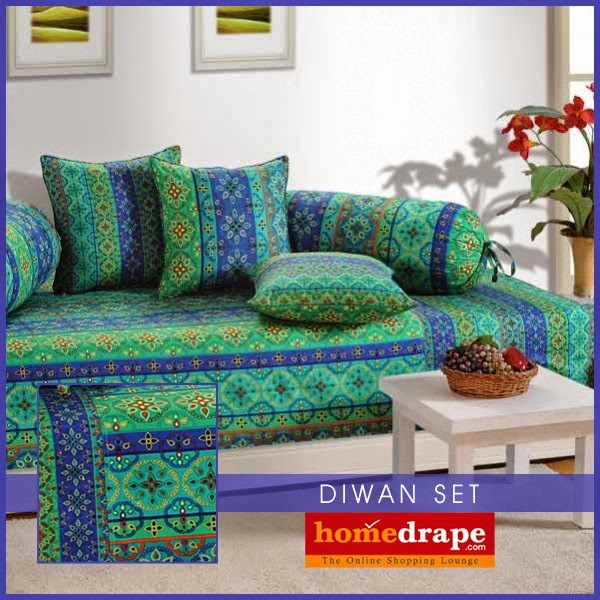 The simple home based care is required for cotton diwan sheets. Just make sure the cotton quality is premium to stay away from color bleed and shrinkage problems. Colors look brilliant on cotton while its soft and smooth texture won’t leave you without caressing.